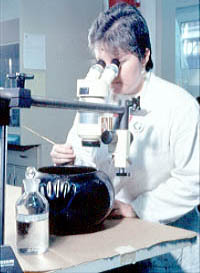 Conservator testing ethanol on a pot. Photo courtesy of the Art Conservation Center @ Univ. of Denver (formerly RMCC), Denver, CO. The preservation and conservation of archeological objects and associated records is a continuing process. The goal is to maintain an item in a stable condition. All items have a limited life span and are never immune to agents of deterioration, no matter what measures are taken. Archeological materials face even more conservation and preservation problems because they are already old and deteriorated. Active conservation measures can be costly and decisions on proper care need to be considered carefully. This is one reason why conservation and preservation should be a collaborative effort between conservators, archeologists, curators, archivists, and registrars. As well, such considerations need to begin before a field project starts (see Sections V and VI). One of the best approaches to conservation is prevention. It may take less time, less money, and less effort to slow down or prevent deterioration than it takes to repair or replace material remains or records after they have deteriorated. Prevention involves proper housing using long-lived and durable containers, storage, and handling. It also involves constant monitoring and control of both the physical environment and the collections themselves, many of the measures previously outlined for packing and storage. Condition reports are another essential element of the monitoring process. These may be prepared by collections management staff or conservators and need to be readily accessible in an accessions file or similar location. Establish the exact condition of an object or associated records. Benchmark the type and/or rate of deterioration taking place. Document the condition history and treatment of an object or group of associated records. This is especially important for archeologists who are sampling a collection for scientific analysis. They must know about any treatments in case those treatments could affect the analytical process and results. Set priorities for conservation care and treatment. Make future handlers aware of seen and unseen problems. Buckskin jacket in humidification chamber. Photo courtesy of the Art Conservation Center @ Univ. of Denver (formerly RMCC), Denver, CO. The documentation in a condition report may be textual notes, sketches, and/or photographs. It is important to maintain consistency in these reports. Items should be examined in a consistent manner and under consistent conditions. Consistent use of terms and qualifiers is also important (i.e., good, bad, scratched, abraded, etc.). Establishing an item's or collection's condition may aid in the identification of further conservation needs. There are five basic types of conservation that may be applied (adapted from UKIC 1983 guidelines). Full Conservation – Includes photography, x-radiography, examination, investigation, cleaning, active stabilization, and reconstruction. All of these procedures should be reversible. Appropriate analytical information provided where required. 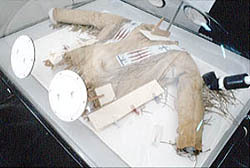 Display Conservation – In addition to category 1, may include further cleaning, additional restoration, and cosmetic treatment. Partial Conservation – Includes work in category 4 and a high degree of cleaning with or without active stabilization. May include reassembly of broken or detached fragments, but not reconstruction of missing areas. Minimal Conservation – Includes "first-aid" measures, x-radiography, and photography, and a minimum amount of investigative cleaning. May include suitable packing or repacking for stable storage. No Conservation – No work of any kind by the laboratory or repository except for handling and checking. Specific conservation treatments vary for every item. Detailed conservation work should only be attempted by a trained conservator. An inferior conservation treatment often causes more harm than good. Below is a chart of some basic cleaning and storage measures for common archeological materials, including associated records (Cronyn 1990; Sease 1994; Puglia 1999a). These are only generalizations. Specific courses of action depend on the item's archeological environment, state of deterioration, and expected use. Again, consult with a conservator before doing any active treatments. Regardless of the choice of conservation, every procedure and material used should be fully documented for future archeologists, conservators, archivists, and others. BONE, ANTLER, IVORY Hardening with drying. Possible shrinking, warping, cracking, and delamination. Dry brush. If wet, clean when still damp. Mechanical methods may be used. 45-60% RH, below 75° F. Controlling RH is essential. Human remains need special consideration. CERAMIC Hardening of dirt or salt encrustation. Crumbling possible. Breakage and abrasion. Crazing or crizzling of glaze. Wash with water or dry brush. Dry completely. Do not clean specimens that will be used for scientific analysis!! Stable RH, also for ceramics with soluble salts. Control humidity to prevent soluble salt crystallization. Support & careful handling essential. proprietary format. Recopy every 2 yrs thru data migration. Upgrade related software & hardware. 68° F, 30-40% RH. Store vertically in dust-free environment. GLASS Crizzling, weeping, iridescence, efflorescence, & devitrification. Spot clean. Dry thoroughly if washed. An RH below 42% for weeping glass. Keep away from heat in storage & exhibition areas. LEATHER, SKIN, FUR Drying can cause shrinking, curling, & cracking. May use damp swabs or dry brushes. Wet leather may be cleaned with water & soft brushes. Proper support essential. Cold storage best for furs. MAGNETIC MEDIA (including magnetic tape for digital data) Tape adhesion, tape cohesion (binder flakes off), high curl of tape, & high friction from tape stickiness. Rewind tape at controlled tension every 3 years. Make copies for use. Recopy every 5 years. Store originals at 40° F, 20% RH, no lower. Store usage copies at 60-74° F, 25-55% RH, Store vertically; Keep away from magnetic fields. METAL Tarnish and corrosion. Do not wash!! Work with a conservator if corrosion products must be removed. Actively corroding, dry metal should be stored in a dry microenvironment (below 35% RH). PAPER Mold, rips, tears, & buckling. Fumigation. Gentle brushing. 60-75° F, 40-55% RH. Store in buffered folders and boxes, usually in vertical position. PHOTOGRAPHIC MATERIALS Curling or planar distortion; silver mirroring of image details; emulsion cracking, softening or flaking; mold; pest damage. Contact a photo conservator. Handle with gloves. Around 68° F, 20-40% RH. Store in the dark; 50-100 lux for exhibition. Use sleeves, folders, and boxes of neutral pH (unbuffered preferred) paper or inert plastics. STONE Powdering, crumbling, cracking, spalling, & delamination possible. Wash in water with gentle brush or dry brush. Dry thoroughly. Do not clean specimens that will be used for scientific analysis!! Store heavy objects appropriately. TEXTILE Crumbling and fragmentation. Light, mold, pests, & bacteria are problems. Do nothing. Low light essential, 50 lux max. Acid-free storage needed. Flat storage usually best. Minimize exhibition & handling. WOOD, FIBER Shrinking, swelling, cracking, and warping. Fungi, bacteria, & pests are major problems. Do not clean unless necessary! Dry brush or low vacuum through a screen. Low light. Keep dust free.